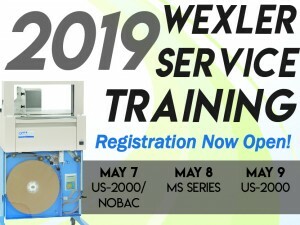 Wexler Packaging Products is excited to announce our 11th annual FREE service training! We will host our annual training this year on May 7th, 8th, and 9th at our office located in Hatfield, Pennsylvania. We are proud to offer this service to our customers to not only provide you with the best experience possible, but to allow you to learn the ins and outs of your equipment which can save you time and money. Our team has developed an interactive program designed to give you an in-depth understanding of how to service and maintain your machines. This program will consist of topics such as machine setup, machine operation, routine maintenance, and troubleshooting. We will also ensure you receive plenty of hands-on training and Q&A sessions. Complimentary breakfast and lunch will be provided. All attendees will also receive a Certificate of Completion for their specific program. Tuesday, May 7th will focus on ATS US-2000’s and the Ravenwood Nobacs, Wednesday, May 8th will focus on the ATS Heat Sealing MS Series, and Thursday May 9th will be centered around the ATS US-2000’s Registration is now open and we welcome you to sign up today!